Delhi University has released the DU LLB Expected Cut off for the DU LLB Entrance Exam 2018.The DU LLB Entrance Exam is a national level exam which is held in the offline mode i.e. the pen paper mode. The total number of applicants for DU LLB Entrance Exam 2018 were around 25,000 and the total number of test takers were around 18,695. Out of these total number of people appearing on the Law Entrance Exam, there will be only 2310 people who will be finally selected. 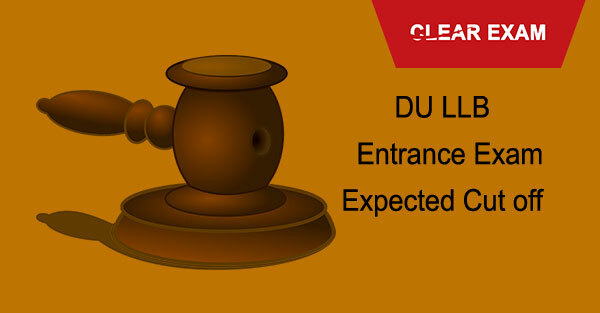 The DU LLB Entrance Exam will be conducted in May and the Admit Card will be released in April. The DU LLB Entrance Exam Results will be announced in May. In this article, we will discuss the cut off for DU LLB Entrance Exam, but before that let's look at how to get merit list. On your keyword type Ctrl and F together and that will help you find your details in the list. A search box would open and you have to type your name in the box. Verify that the roll number that is shown against the name is your roll number. Last, of all, you should save the link for yourself for future reference. After the announcement of results and merit list, Delhi University will allocate the seat of the selected candidates. The seat allocation will be done through counselling process which will begin from June 2018 and will go on until last week of June 2018. For students who will be invited to counselling the first condition is that the student must have his name in the merit list and he should have scored minimum cut off marks. Let us look at the category wise expected cut off marks and cut off ranks for the year of 2018. What we arrive at is that the total seats taking into account all colleges are 2611. Let us look at what percentage of reservation is there for different categories. This is all information about the date of announcement of Result and the merit list, cut off marks and ranks, total seats, and reservation of seats. Hope this information was helpful. Check here the DU LLB Cut Off 2018 released by Delhi University for DU LLB Entrance Exam.